For thirty-three years Fritz Trautmann's passion for painting inspired his students in MAG's Creative Workshop. 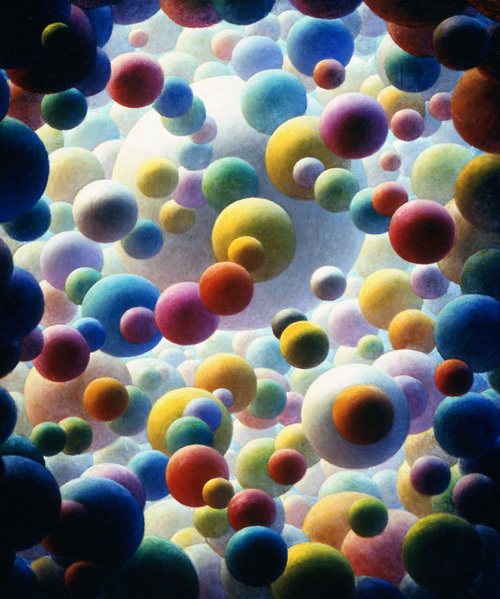 Over his lifetime, he developed an approach to color that was scientific as well as mystical, and in 1942 he painted Galaxy to teach his theories to students. MAG purchased the painting from the artist in 1956. It has been a visitor favorite ever since. Galaxy symbolizes the great truth that every phenomenon in life involves ALL of life. Each globe of Galaxy is composed of EXACTLY THE SAME ELEMENTS. The entire spectrum wraps itself around each globe with unvarying uniformity. Warm red plays across the field from the left, bright yellow streams down from above, cold blue comes in from the right, and deep violet rises from the bottom.